The perfect option for marketing on the go! Get all the attention that you deserve! 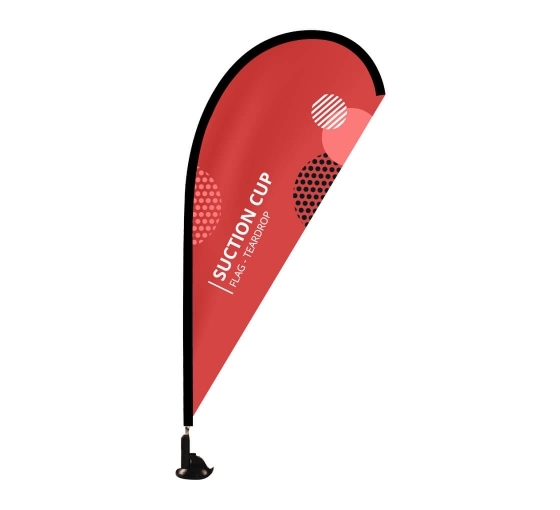 Our suction cup flags for advertising are durable enough to be used for several years. Attach them to any surface you want, and get the word out! The suction cup flags can be used for both corporate and personal uses! Our suction cup flags are available in three fun shapes: rectangle, blade and teardrop. Choose any of these, and you are sure to get quite some attention. We offer hardware (pole and suction cup) with both our single sided and double sided customized business flags! If you order the single sided flag, we will print in with 100g knitted polyester. The other side is usually not visible so we leave that blank; this brings our costs down, and in turn, you enjoy some savings! If you order double sided, customized business flags, then we will use 100D polyester and block out liner for printing. Place an order for our suction cup flag today!